�Ģ When is asbestos a problem? �Ģ	What should my school and school district be doing about asbestos? �Ģ What can I do to help? The Environmental Protection Agency (EPA) is releasing this updated document in conjunction with the National Parent Teacher Association (PTA) and the National Education Association (NEA) due to an ongoing concern about asbestos in elementary and secondary schools nationwide. 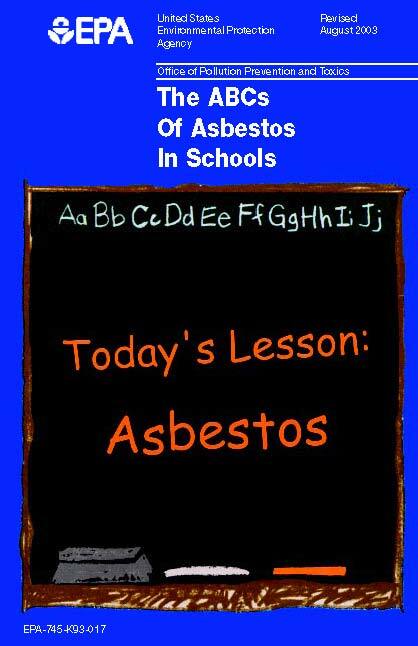 This pamphlet can help parents and teachers answer questions and learn the facts about asbestos in schools. It also outlines the responsibilities of school boards and other school officials to protect school children and employees from possible exposure to asbestos. sbestos is a mineral found in certain types of rock formations. When mined and processed, it takes the form of very small fibers which are usually invisible to the naked eye. 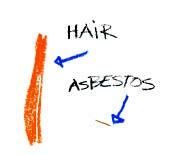 A typical asbestos fiber is 1,200 times smaller than a strand of human hair. These individual fibers are generally mixed with a material which binds them together so that they can be used in many different products. Because the fibers are so small and light, they can remain in the air for many hours if they are released from asbestos-containing material. This increases the chance that someone will inhale them. Asbestos became a popular commercial product because it is strong, won���t burn, resists corrosion, and insulates well. Its commercial use in the United States began in the early 1900s, when it was used as insulation in steam engines. Since then asbestos has been used to create about 3,000 different products, including insulation and fireproofing. The peak years of asbestos use in schools were from World War II until the 1970s. these products varies widely, from less than 1 to 100 percent, depending on the use. 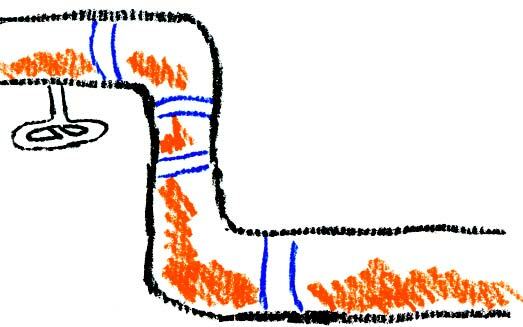 Pipe and boiler insulation typically contains more asbestos than other building materials. The precise amount of asbestos in a product cannot always be deter-mined from labels ��� since most products used in the past were not labeled ��� or by asking the manufacturer. Instead, positive identification of asbestos requires analysis of samples by a qualified laboratory. ntact and undisturbed asbestos materials generally do not pose a health risk. Asbestos materials, however, can become hazardous when, due to damage or deterioration over time, they release fibers. If the fibers are inhaled, they can lead to health problems. protective casing which prevents fiber release unless the casing is damaged. Some materials, which are considered ���nonfriable,��� such as vinyl-asbestos floor tile, can also release fibers when sanded, sawed or otherwise disturbed. Materials such as asbestos cement pipe can release asbestos fibers if they are broken or crushed when buildings are demolished, renovated or repaired. ost asbestos-containing material can be properly managed where it is. In fact, asbestos that is managed properly and maintained in good condition appears to pose relatively little risk to students and school employees. 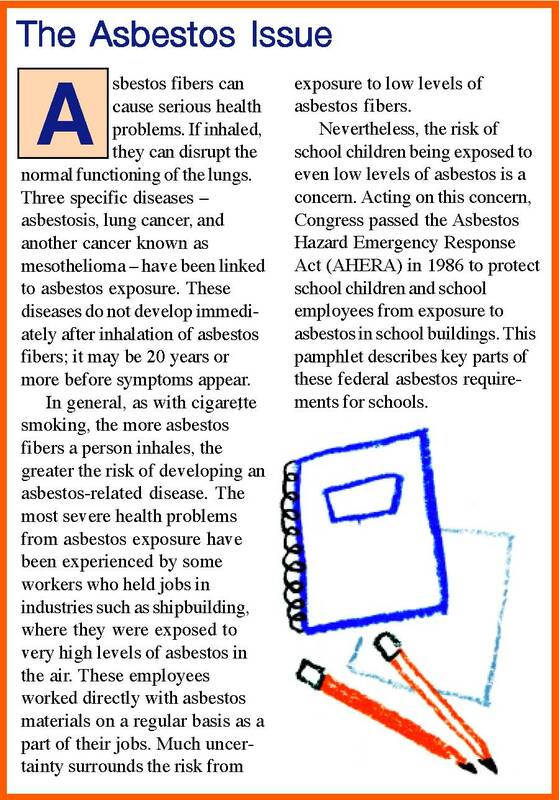 Accordingly, the AHERA schools rule rarely requires the removal of asbestos materials. Proper asbestos management begins with a comprehensive inspection by qualified, trained and experienced inspectors, accredited through an EPA or state-approved training course. Inspecting the condition of asbestos materials ��� initially with AHERA-accredited inspectors and at least semi-annually with trained custodial or maintenance staff ��� is extremely important so that changes in the material���s condition, such as damage or deterioration, can be detected and corrected before the condition worsens. Sometimes normal school or maintenance activities can damage asbestos material and cause fiber release, particularly if the material is ���friable.��� A thorough initial inspection and regular surveillance can prevent accidental exposure to high levels of asbestos fibers. The methods (see page 7), in AHERA terminology, are asbestos ���response actions.��� The last three methods of response actions ��� encapsulation, enclosure, and removal ��� and sometimes the second method ��� repair ��� must be done by accredited asbestos professionals. containing materials are kept in good condition. This is the most common method when the materials are in good condition at the time of initial inspection. �Ģ	Placing a barrier around the materials, which is known as an enclosure. �Ģ	Removing asbestos ��� under special procedures. and other actions will not control fiber release. Although the AHERA schools rule does not prohibit schools from removing any asbestos materials, removal decisions should not be made lightly. An ill-conceived or poorly conducted removal can actually increase rather than eliminate risk. Consequently, all school removal projects must be de-signed, supervised, and conducted by accredited professionals and should be performed in accordance with state-of-the-art procedures. In addition, schools may wish to hire an experienced and qualified project monitor to oversee the asbestos contractor���s work to make sure the removal is conducted safely. Only an AHERA-accredited management planner ��� an asbestos professional with proper training, qualifications, and experience ��� is authorized to advise school officials on which response action is appropriate for a particular situation. The final selection of the proper method is up to school officials after they receive the advice of the school���s accredited management planner. 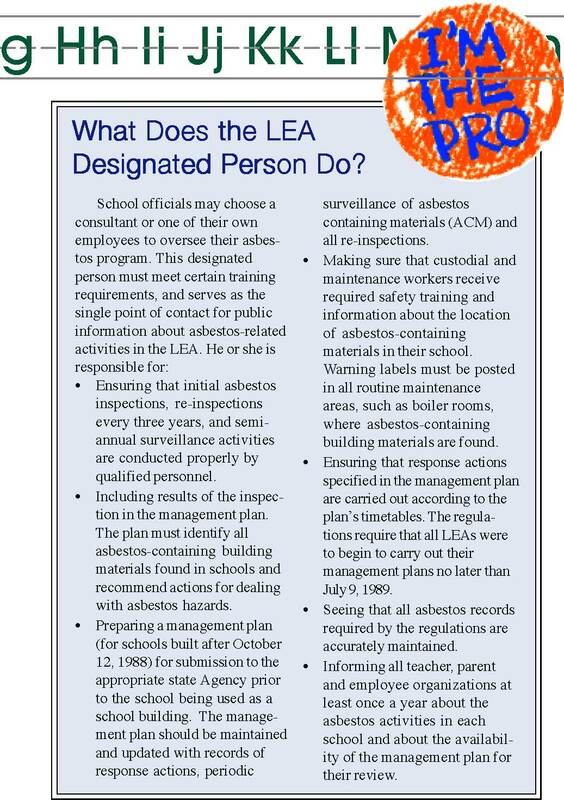 oversee asbestos-related activities in the school system. ���friable��� and ���nonfriable��� asbestos-containing building materials. managing asbestos and controlling exposure in each school. to identify and carry out whatever asbestos actions are necessary and appropriate to protect health and the environment. These actions or methods must be documented in the management plan. 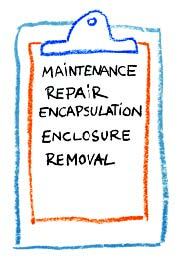 asbestos inspection and the availability of the asbestos management plan for review. persons to conduct inspections, to develop the asbestos management plan, and to carry out the appropriate response actions. related activities in the plan and make them available for public review. the most important thing you can do first is to learn about your school���s asbestos activities. As you do so, remember that the mere presence of asbestos in a school doesn���t necessarily mean that the health of its occupants is endangered. Again, asbestos that is managed properly and maintained in good condition poses relatively little risk. 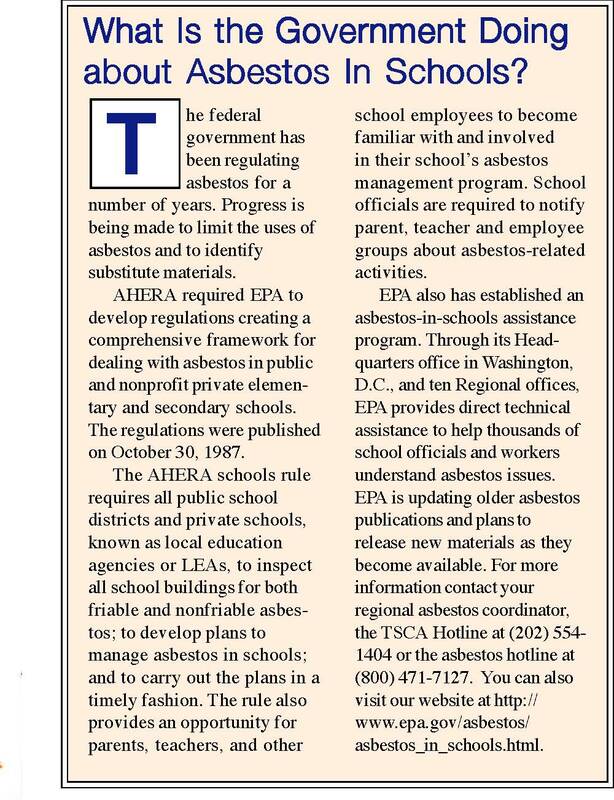 Federal regulations do not require the removal of all friable asbestos from schools until the building is demolished. In fact, during the life of the building, other methods of dealing with the material are often preferable to removal. In those cases when removing asbestos is deter-mined to be the appropriate decision, the work must be done under strict controls by trained, qualified and experienced asbestos professionals who are properly accredited under AHERA. Your first step is to make sure your school has prepared an asbestos management plan as required by AHERA. By becoming familiar with this plan, you will know if asbestos materials are in the school, what plans the school has for managing this asbestos, and when these activities are scheduled to occur. nder AHERA, citizens have the opportunity to be-come informed about asbestos activities in their schools. If you have a question or concern about those activities, you should first contact your LEA designated person. This person knows the most about the asbestos situation in your school. When you find out who this person is, ask him or her what steps your school has taken, and will continue to take, to meet the requirements of the AHERA schools rule. 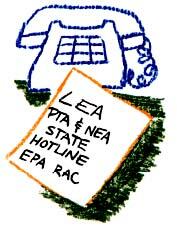 The LEA designated person also can tell you which agency in your state government is responsible for state AHERA activities. The same agency usually is responsible for reviewing the LEA���s asbestos management plan. This LEA designated person also should be aware of any local asbestos control requirements. 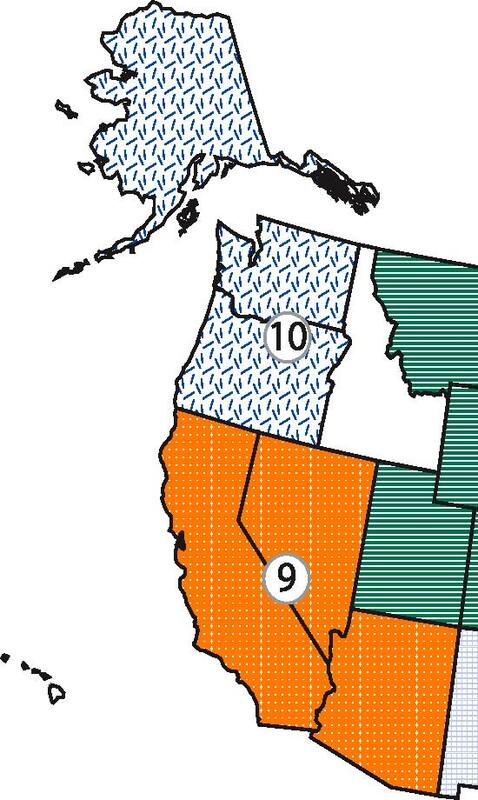 State AHERA designees also are a good source of information. These officials can help you better understand the AHERA schools rule and can answer questions about your school���s asbestos activities. You also can contact your EPA regional office. 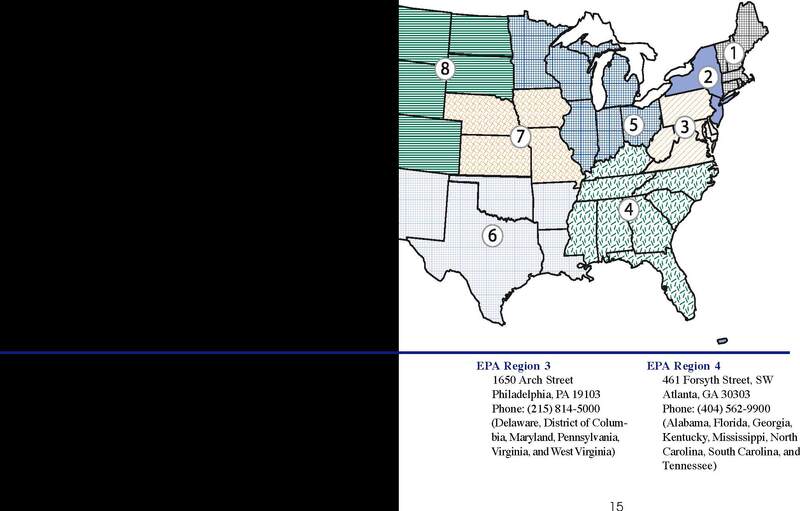 There are ten EPA regional offices around the country, and each one has a Regional Asbestos Coordinator (RAC). Their addresses and phone numbers are listed at the end of this pamphlet. School employees cannot be penalized for contacting EPA or the appropriate state agency to discuss their concerns about a school���s asbestos program. groups worked with EPA in developing the AHERA schools rule, and some have started their own educational efforts to improve understanding of the AHERA requirements and proper asbestos control practices. The addresses and phone numbers of the national offices of PTA and NEA are listed at the end of this pamphlet. The EPA Toxic Substances Control Act (TSCA) Hotline is available to answer your questions about the new AHERA regulations and about asbestos in general. You can obtain a variety of information by calling the TSCA Hotline at (202) 554-1404 or the asbestos hotline at (800) 471-7127. 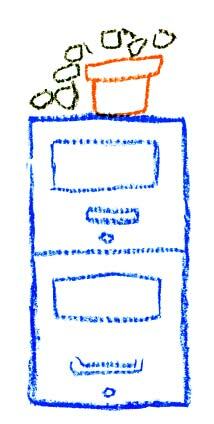 You can also visit our website at http://www.epa.gov/ asbestos/asbestos_in_schools.html. 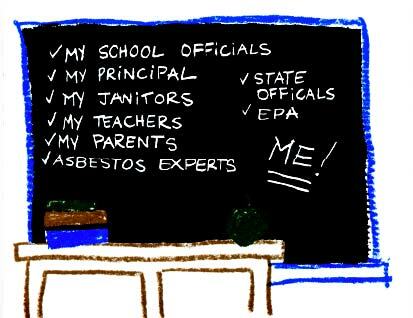 Finally, EPA has an asbestos ombudsman to help citizens with asbestos-in-schools issues, questions, and complaints. This office can be reached through a toll-free number at (800) 368-5888.